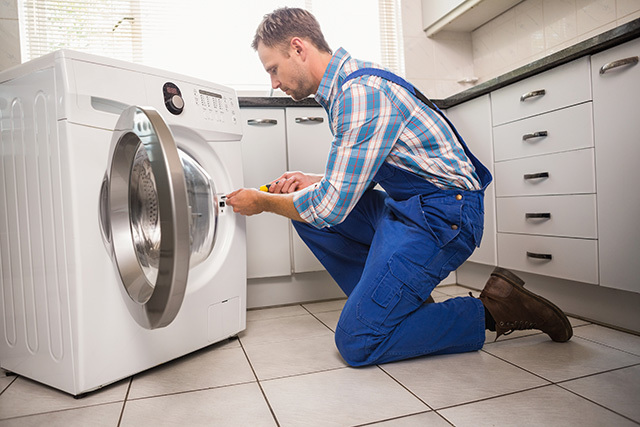 We repair washing machines and washer-dryers across Derbyshire, Nottinghamshire and Staffordshire, in your home. We repair both free-standing and built-in machines. Washercare Ltd. has been repairing washers across Derbyshire and Nottinghamshire since 1985. We have 1000's of spares waiting to be fitted by our expert engineers. * In the majority of cases we can provide a free quote over the phone. In cases where we do need to come out to give you a quote, we charge £20 to cover the running cost of the vehicle and enable our engineers to spend the time diagnosing the fault. Our engineer will endeavour to repair or replace your appliance, so then the £20 charge can be waived. ** We offer up to 2 years parts guarantee, dependent on the parts we fit. We strive to keep all our customers happy, so we supply and fit both manufacturer original parts, as well as generic parts. We will explain the difference in cost and guarantee before fitting any parts. "Wayne was very obliging and went out of his way to get to us quickly. He was polite and helpful. Would highly recommend." "Washercare came out on a Saturday at no extra cost. When they looked at the washer they said the fault was due to incorrect plumbing and told us how to sort it out ourselves. No charge was made for coming out or for the advice. Excellent service and I will definitely use them again." "The trader not only fitted a door seal for my washing machine, but also cleaned around the door area and levelled the machine at no extra cost. He arrived on the day stated and worked in a clean fashion leaving no mess." Quotes left by our customers on the Derbyshire Trusted Trader website.